THE ALBUM quilt is a real old-timer. Its original purpose was for a gift for a bride-to-be. A group of friends would get together and each would piece a block and embroider her name upon it! One block when completed is ten and one-half inches square if seams are added to these cutting units. Set the blocks together diagonally with alternate white squares measuring ten and one-half inches. 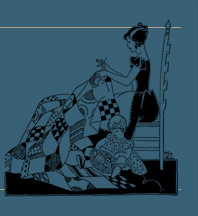 The total number of pieced and white blocks used of course varies according to the size and shape of the quilt desired. 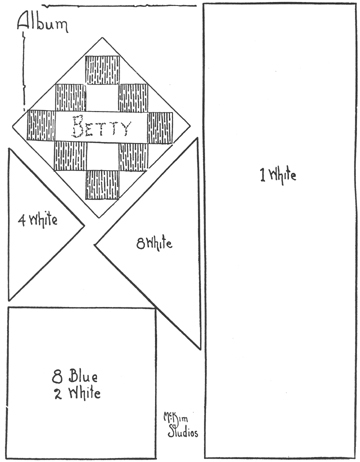 Material estimate: Blocks 10 1/2 inches square, 15 inches on the diagonal, require 2 yards of blue and 6 yards white. This allows for a large size quilt 79 inches wide by 85 inches long. This would be five blocks long and 5 wide, diagonally placed, plus a 5-inch border of white at top and bottom and 2-inch border of white at sides. All together there are 25 pieced blocks, 16 plain blocks, 16 plain 1/2 blocks, diagonally cut, and 4 plain 1/4 blocks on four corners.